Automatic Ticket Vending Machine (ATVM) as it is called, is a direct, easy and faster way to cut off to those old UTS (Unreserved Ticketing System) queues for getting daily and seasonal tickets for Mumbai local trains. Phased out CVM (Coupon Validating Machine) was its previous alternative. Below are complete details of ATVM with demo video of how it works.. Legends : Jansadharan Ticket Booking Sevak (JTBS), Coupon vending Machine (CVM) and Station Ticket Booking Sevaks (STBS), Unreserved Ticketing System (UTS). Updates 2017 : More and more people are using ATVM machines and more and more machines are seen not working on many railway stations. Regular check of these machines at major stations like Virar, Dadar, Churchgate and others in Central and Harbour route is required. Updates 2015 : New Local Train Mobile Ticketing option have been added along with ATVM machines started in December 2015, Yet not popular as App ticketing. Long queues, Currency coin changes (‘Chutta’) and rush around ticket windows brought the much required ticketing technology called ‘ATVM’, an Automatic ticketing machine which operates by a Smart Card to save commuters time. This Automatic ticketing machines were introduced on 10th October 2010 as easy to use ticketing system for betterment on public commuting in Local Trains of Mumbai. Western Railway was first to introduce such Machines which was followed by Central railway route too. More than 10 Millions commuters who daily travels via Mumbai local trains now uses this alternative ATVM machines, a good alternative to CVM and UTS. A Smart Card (See Picture) is required to operate this machine which are available at regular ticket windows. The journey time restriction and everything else is same as our regular tickets bought via CVM. Just show your Photo ID proof and get a Smart card, Recharge it from regular ticket windows as and when required, Its that simple. Validity of this travel card is 12 months from purchase date or recharge date. Travel within 1 hour limited time using this card tickets. 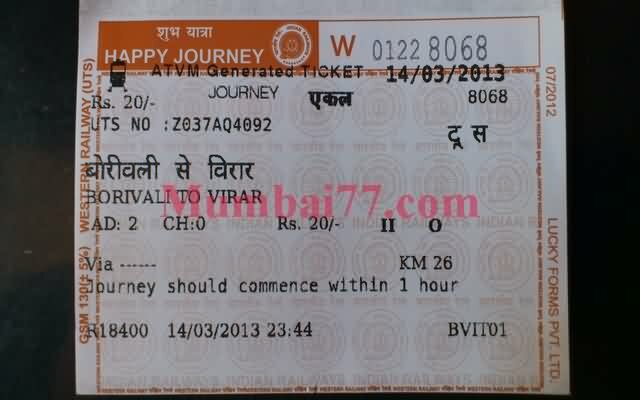 Railway authority offer 5% extra bonus on every recharge to promote more usage of this cards. Technically the touch screen ATVM machine has all that a computer system has, A Processor, Monitor, Touch Screen and a smart card reader which is at left side below screen. The Machine is Multilingual and support languages like Marathi, Hindi, Kannad and Bangla with default language being English. Out of about 1 million daily ticket buyer local train travellers, 13 to 15 percent of them use this smart cards. 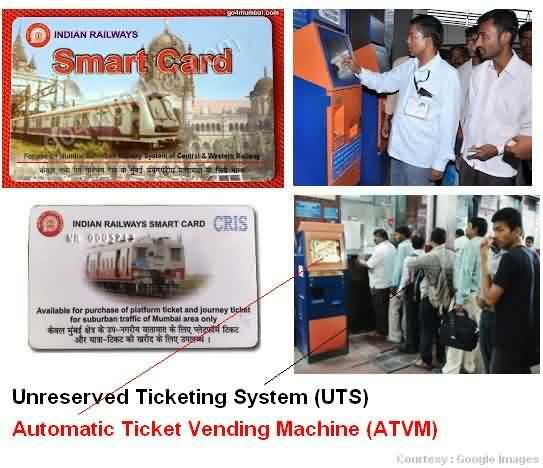 Total ATVM Machines installed at Mumbai (Western & Central Railway) Suburbs are 250. New 135 Such Machines will be installed in Central Railway, Out of which 86 to be installed on Main Line, 43 on Harbour Route and 6 at Trans-Harbour lines. Major stations like Thane, CST, Kalyan and Vashi commuters getting relief from long queues to get tickets. Another 940 such Ticket Vending Machines are expected by March 2013. Coin Operated ATVM are expected soon as per news. ATVM machines did not got that much of response as expected because not all commuters found it easy to operate, The touch screen getting little touch insensitive with time and understanding the START and END route was initially not easy. Basically the user interface can be made more easy. But with time many people got use to using this machine. Smart Cards once lost can be used by any person, So adding on full recharge of Rs.500 can sometime be risky. Total of 40 Lakh commuters daily commute on Central Railway route via local trains. The AVTM users have increased from 5% during 2011 to 25% now in 2013 and still growing now in 2017. Till date total of 386 ATVMs are operating and Railway plans to add more 286 soon possibly in early 2014. JTBS users were NIL in 2011 and now have raise directly to 20% which is really good. As of December 2013, their are 288 JTBS counters in Central railway Route. CVM machine are already Phased out. Majority still lies with UTS users which saw a decline from 60% since 2011 to 50% as of now. For more information see the Smart Card Demo. At End of 2014 or in January 2015, Central Railway has added many more machines taking the total numbers to 112. Out of these 7, 4 will be added at Byculla and another 3 at Sandhurst Road. For people staying in western railway route Virar, 1 ATVM machine has been added on Platform No.8 which was much required. Keep your smart card on ATVM machine’s card sensor area below Left side of Screen. Use the Screen (Touch Enabled) to select the language first (English, Hindi and Marathi, Kannada and Bangla) are available languages. Click ‘Select Map’ and railway station routes will be in front of you. Select your destination and in next window confirm the destination again. If you want a return journey ticket, Select change journey option and select return ticket. Select and Click the PRINT to get your ticket from Validating machine slot. Unlike the seasonal pass (Monthly, Quarterly and Yearly) which required identity proof of purchaser, Anybody from your family and friends can purchase and use this card to travel around Mumbai western and Central Railway routes. The time printed on Ticket by validating machine is generally rounded in hour (60 minutes), So if for example the Machine has timing of 5:05 Pm and you request printing a journey ticket at that time, then it will print 6:00 pm, Wow this is a bonus of 55 Minutes extra which is added to 1 hour duration time which calculates the total journey valid time as 1 Hour (As per ticket rules) and 55 minutes extra. We really don’t know if the new ATVM or upgraded software of machines will retain and have this facilities. No need to keep exact fare change amount. You can directly go to window, No queue required to purchase smart card or do the recharge. Now a days, ATVM machines do have queues if less machines and more crowd, Although this do not happen at many stations. Below is the picture of actual local train ticket received from an ATVM showing details like Journey date, UTS No, Number of Adults and Children travelling, Commencement to be done within 1 Hour, Journey FROM and TO Station names, Class (First Class or Second), Total Kilometres etc.